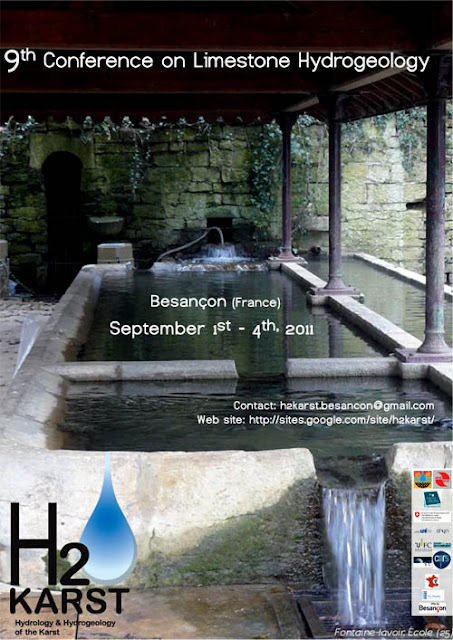 After a first conference held in 1971 in Besançon, the hydrogeologists of the Besançon and Neuchâtel teams organise every 4 to 5 years an international event which is the meeting place of searchers, students and practicioners of karst groundwater. Except the 1997 meeting, which was organized in the framework of the 12th International Congress of Speleology in la Chaux-de-Fonds, the conferences have been organized in turn in Besançon (1976, 1986, 2001) and Neuchâtel (1982, 1992, 2006*). Over the years, this franco-Swiss symposium took a real international dimension, receiving colleagues originating from 25 - 30 countries located on four continents. The next edition is scheduled in Besançon, a university city inscribed in 2008 to the Worldwide Heritage of the UNESCO, for its group of XVIIth century fortifications, constructed by Vauban. The 9th conference on limestone hydrogeology will be organised in 6 sessions and 2 excursions. The 6 sessions will take place on September, 1st and 2nd, 2011 at the University of Franche-Comté. The 2 excursions will be organised in parallel on the September 3rd, 2011 in the Swiss Jura Mountains (Areuse karst aquifer) ; or in the Franc-Comtois Jura Mountains (Fertans experimental site - Lison springs - Salins-les-Bains saltpans). Thanks to your contribution, 144 abstracts have been received so far. During the conference, the proceedings will be distributed to the participants. A selection of articles in English will be published by Springer editions.